Department of Biology, College of Arts and Sciences, University of the Philippines Manila, Padre Faura Street, Ermita, Manila, PHILIPPINES. College of Medicine, University of the Philippines Manila, Pedro Gil Street, Ermita, Manila, PHILIPPINES. Macrofungi have been used in the Philippines as source of food and traditional medicines. However, these macrofungi in the Philippines have not yet been studied for different biological activities. 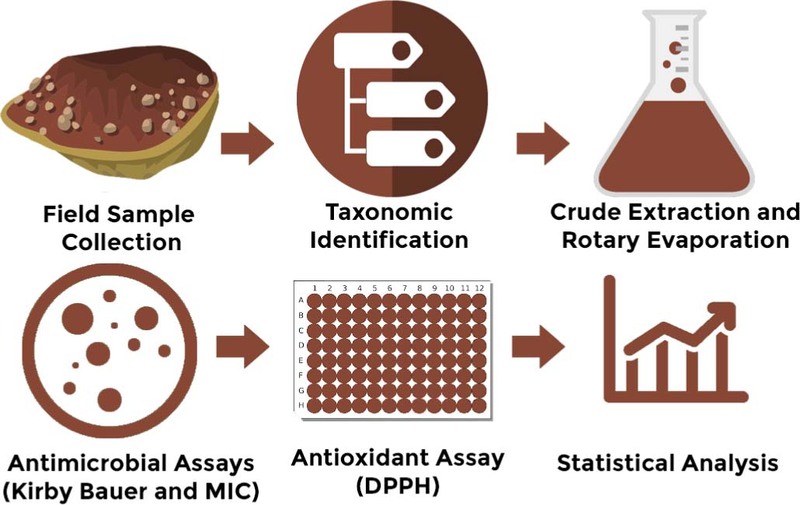 Thus, this research determined the potential antibacterial and antioxidant activities of crude ethanolic extracts of seven macrofungi collected in Bataan, Philippines. Kirby-Bauer disk diffusion assay and broth microdilution method were used to screen for the antibacterial activity and DPPH scavenging assay for the determination of antioxidant activity. F. rosea, G. applanatum, G. lucidum and P. pinisitus exhibited zones of inhibition ranging from 6.55 ± 0.23 mm to 7.43 ± 0.29 mm against S. aureus, D. confragosa, F. rosea, G. lucidum, M. xanthopus and P. pinisitus showed antimicrobial activities against S. aureus with an MIC50 ranging from 1250 μg/mL to 10000 μg/mL. 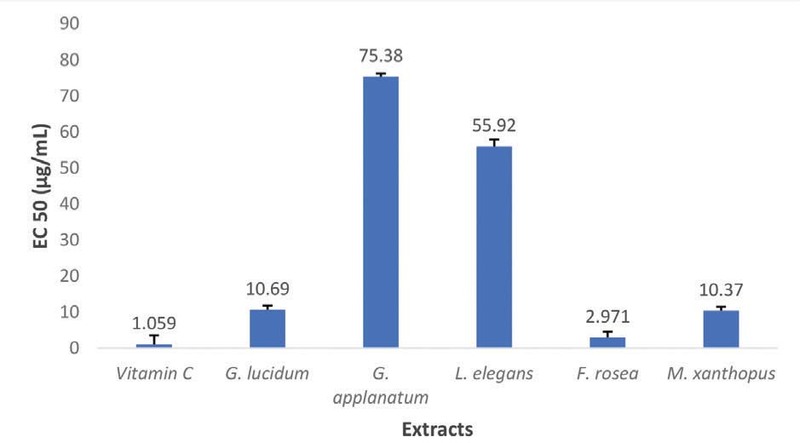 F. rosea, G. applanatum, G. lucidum, M. xanthopus exhibited excellent antioxidant activity with F. rosea having the highest antioxidant activity among all the extracts tested (3.0 μg/mL). Based on the results, these Philippine macrofungi showed antistaphylococcal activity independent of the antioxidant activity. These can be further studied as potential sources of antibacterial and antioxidant compounds. The aim of this study was to determine the antibacterial and antioxidant activities of crude ethanolic extracts of Daedaleopsis confragosa (Bolton) J. Schrot., Fomitopsis rosea (Alb. & Schwein.) P. Karst, G. appla natum (Persoon) Patouillard, Ganoderma lucidum (Curtis) P. Karst., Lenzites elegans (Spreng.) Pat., Micro porus xanthopus (Fr.) Kuntze, and Polyporus pinisitus. In vitro methods of antibacterial evaluation against Staphylo coccus aureus and antioxidant assessment via 2,2-diphenyl-1-picrylhydrazyl (DPPH) scavenging were performed using the mushroom extracts to determine the species with potential bioactive molecules of pharmaceutical importance. The mushroom species were collected from three sites Sitio Pastolan, Hermosa from July to December of 2016. The map coordinate of the study site is 14°50’26.29”N and 120°20’47.17”E. Collected macrofungi were wrapped in newspaper. Each were labeled accordingly and voucher specimen were submitted to the National Museum of the Philippines for taxonomic identification. Macrofungi were weighed separately using a top-loading balance. They were dried in the oven overnight at 40°C and were air-dried after for seven days. They were washed with distilled water and cut into small pieces. About 150 grams of each macrofungus were soaked in 500 mL of 95% ethanol for five days. Filtration was done using Whatman filter paper No. 1. The supernatant was concentrated by a rotary evaporator at 40°C. Stock solutions were prepared by dissolving the dried extracts in 1% DMSO to a concentration of 100mg/mL after collection. The extracts were stored at 4°C for subsequent use. Staphylococcus aureus (ATCC 25923) was retrieved from the Department of Medical Microbiology, College of Public Health in the University of the Philippines Manila. A 24 h culture of S. aureus was prepared prior to the methods of disk diffusion assay. It was inoculated in sterile Brain Heart Infusion broth with the turbidity adjusted to 0.5 McFarland standard of approximately 1.5×108 CFU/mL. A volume of the inoculum was swabbed on Mueller-Hinton agar plate using a sterile cotton swab within 15 minutes after standardization. Twenty microliters (20μL) of the crude ethanolic macrofungal extract were loaded on sterile 6 mm paper disks and were placed on the agar plates. Ciprofloxacin (5 μg) was used as the positive control while 95% ethanol and 1% DMSO were used as negative controls. Incubation of the plates were done at 35±2°C for 16 to 24 h. The setup was done in triplicates and the diameters of zone of inhibition were measured in millimeters using a Vernier caliper. The minimum inhibitory concentration at which 50% of the bacteria were inhibited (MIC50) of the macrofungi was determined by broth microdilution method according to Clinical Laboratory Standard Institute M07-A9 (2012). Two-fold dilution of the macrofungal extracts with a starting concentration of 100 mg/mL was done using Mueller-Hinton broth in Wasserman tubes generating concentrations from 19.5 μg/mL to 10000 μg/mL. One hundred microliters (100 μL) of each macrofungal extract concentration was transferred to its designated plates on the 96-well micro plate. Where Ac is the absorbance of the blank control, As is the absorbance with the extract and Ab is the absorbance of the MHB control. The lowest concentration which had a percentage of at most 50% served as the MIC50 of the extract. Where Ac is the absorbance of the control and As is the absorbance with the extract. Tests were done in triplicates and a calibration curve was constructed with ascorbic acid as the standard. Data were analyzed using the SPSS program and GraphPad Prism. Half maximal effective concentration (EC50) was also computed from the SA values of each ethanolic extract. Shapiro–Wilk test was performed to determine if the data were in normal distribution. Mann-Whitney’s test was done to determine which sample extract has significantly different antimicrobial activity when paired with ciprofloxacin. The test was also done to assess differences between the EC50 values of each extract against the ascorbic acid standard. Differences with p-value of less than 0.05 (P< 0.05) were considered as statistically different. Diameters of zone of inhibitions from the activities of the mushroom extracts are shown in Table 1. G. applanatum, G. lucidum and P. pinisitus exhibited zones of inhibition ranging from 6.55 ± 0.23 mm to 7.43 ± 0.29 mm against S. aureus. The rest of the macrofungi did not exhibit anti-staphylococcal activity. D. confragosa, F. rosea, G. lucidum, M. xanthopus and P. pinisitus showed antimicrobial activities against S. aureus with an MIC50 ranging from 1250 μg/mL to 10000 μg/mL (Table 2). Only G. applanatum and the L. elegans showed no significant MIC50 values against S. aureus. The radical-scavenging effects of the samples were observed by the capacity to decrease the absorbance of the DPPH solution at 515nm. EC50values of the crude ethanolic macrofungal extracts are shown in Figure 2. In general, extracts exhibited DPPH radical scavenging as most have an activity of above 50% at 200 μg/mL (log[extract]: 2.3). Notable effective antioxidant activities due to low to moderate EC50 values include F. rosea, G. applanatum, G .lucidum, M. xanthopus, with F. rosea having the highest antioxidant activity among all the extracts tested (3.0μg/mL). Mean ± SEM diameters of zone of inhibition (mm) of crude ethanolic macrofungal extracts against S. aureus. The map shows the Bataan province, Municipality of Hermosa, Bataan Province, Island of Luzon. DPPH radical scavenging activities of macrofungal extracts from Bataan, Philippines. Each value was expressed as mean ± SEM (n=3). D. confragosa, F. rosea, G. lucidum, M. xanthopus and P. pinisitus showed antimicrobial activities against S. aureus with MIC50 ranging from 1250 μg/mL to 10000 μg/mL. F. rosea, G. lucidum, G. applanatum and M. xanthopus have statistically comparable DPPH scavenging effects (p<0.05) to the standard vitamin C. These Philippine macrofungi can be further explored as potential sources of antibacterial and antioxidant compounds. Isolation of these compounds in further studies can lead to the eventual clinical application of mushrooms as agents against bacteria and oxidative stress. Selected Philippine macrofungi collected from the Municipality of Hermosa, province of Bataan, island of Luzon showed anti-staphylococcal activity independent of the anti-oxidant activity. These macrofungi are Daedeleopsis confragosa, Fomitopsis rosea, Ganoderma applanatum, Ganoderma lucidum, Lenzites elegans, Microporu xanthopus, Polyporus pinistus. The isolation of biologically active compounds as antibacterial agents can be further studied. This work was financed by the UP Manila National Institutes of Health Faculty Research Grant (Project Code: NIH 2015-007). Christine May D. Gaylan: BS Biology graduate at the Department of Biology, College of Arts and Sciences, University of the Philippines Manila, Philippines. John Carlo Estebal: BS Biology graduate at the Department of Biology, College of Arts and Sciences, University of the Philippines Manila, Philippines. Ourlad Alzeus G. Tantengco: MD-PhD in Molecular Medicine student at the College of Medicine, University of the Philippines Manila, Philippines. Elena M. Ragragio: Associate Professor and Chairman at the Department of Biology, College of Arts and Sciences, University of the Philippines Manila, Philippines. Conflicts of interest CONFLICT OF INTEREST The authors declare no conflict of interest. The funding sponsors had no role in the design of the study; in the collection, analyses, or interpretation of data; in the writing of the manuscript, and in the decision to publish the results.